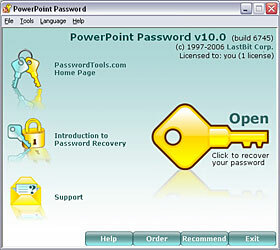 PowerPoint Password is a password recovery tool for PowerPoint. 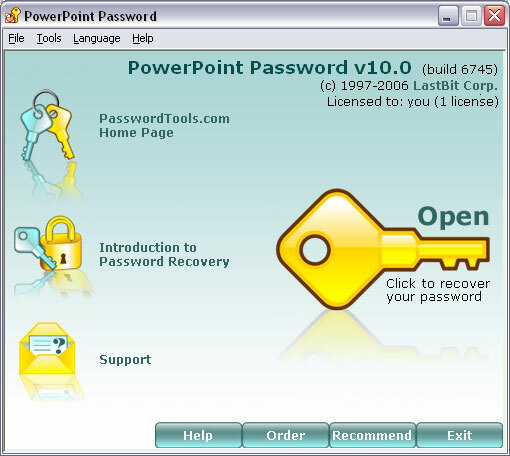 Using PowerPoint Password you can recover lost or forgotten password to PowerPoint (*.ppt) files. Current version of PowerPoint Password supports password to open only. PowerPoint Password supports brute-force attack, dictionary attack, hybrid dictionary attack and SmartForce (TM) attack. If your password is really long and complex, you have poor chances to recover it (competing recovery tools will fail as well). You can find more information on password protection here.